Lupe Valdez at a luncheon for Annie's List, which supports progressive women running for office, on Nov. 10 in Dallas. 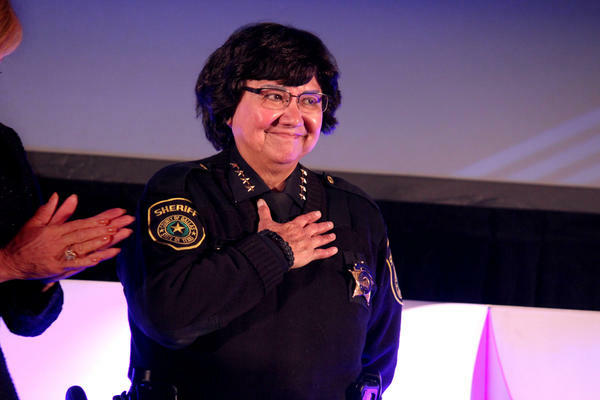 Lupe Valdez is running for governor. The longtime Dallas County sheriff, the daughter of South Texas migrant workers, said Wednesday she will resign to challenge Gov. 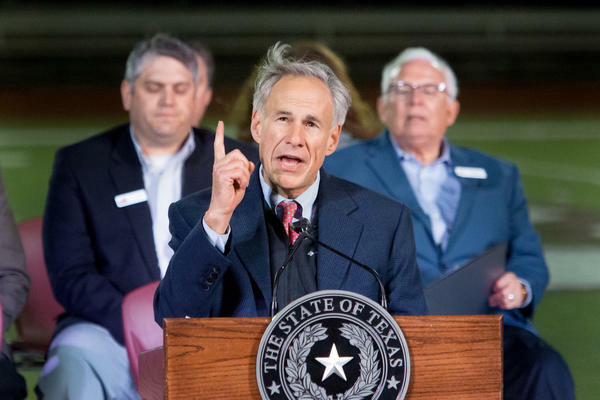 Greg Abbott in 2018. Valdez, 70, is the highest-profile Democrat in what's sure to be an uphill battle. But that’s nothing new for her. After signing her official filing papers Wednesday, Valdez stood at a podium at the Texas Democrats’ headquarters in Austin, and said, "I’m stepping up, estoy obligada, for Texas, for everyone’s fair shot to get ahead. I’m in." Valdez said that she's experienced the struggle many Texans face making ends meet and that she’s proof that education opens doors. Valdez spent a dozen years as Dallas County sheriff. In a StoryCorps interview from 2014, she said she knew when she decided to run for sheriff back in 2004 that she was coming in as an outsider. Not only was she looking to become the first out Latina lesbian in the country to become sheriff, she was doing it as a political unknown. An Army veteran, she spent decades in federal law enforcement jobs before launching her political career. But, this was not the first time she’d faced tough odds. Once in office, Valdez cleaned up a jail system that was in disarray, and took over a department with lagging morale. During her time in office, she’s also seen her political star rise. In an address to the Democratic National Convention in Philadelphia last year, Valdez talked about bridging divides. We have to start listening to each other, she said. That’s why she says she sends her deputies to events celebrating Dallas County’s diverse communities. With her announcement, Texas Democrats are breathing a sigh of relief, according to University of Houston political scientist Brandon Rottinghaus. He says they’d been sweating the fact that they didn’t have a strong candidate at the top of the ticket. Winning the seat will be tough. Gov. Greg Abbott — the man whose seat she wants — is popular, he’s an incumbent, and he’s a Republican in a state that hasn’t elected a Democrat statewide since 1994. By contrast, Valdez is not well known across the state. Rottinghaus says she’s best known for her high-profile tussle with Abbott over the state’s tough new ban on sanctuary cities. That might help with progressives, he says, but not with the rest of the electorate. “So my guess is if there is any name ID, it’s probably pretty negative for most people, and certainly negative for any Republicans or leaning-conservative independents,” Rottinghaus said. Money is also a challenge: Abbott, 60, is a strong fundraiser who’s sitting on a big pile of campaign cash – more than $40 million. Democrats have struggled with fundraising in the past. Cal Jillson from Southern Methodist University says Wendy Davis spent about $40 million in her race against Abbott – and she lost by 20 points. Of course, before she can face off with Abbott, Valdez has got to win the Democratic primary, which will almost definitely include another high-profile candidate. Andrew White, the businessman son of former governor Mark White, is scheduled to announce his election bid soon.